Choosing the right fertilizer to start out your new grass seed is a crucial step to a healthy and lush lawn. By applying a fertilizer to the soil, prior to sowing your grass seed, you will ensure the soil has all the essential nutrients the seed needs to germinate and grow. Before buying a fertilizer for your grass seed, you should become familiar with the needs of the type of grass seed you plan on sowing. Different grass seeds thrive better in different climates, and various grass seeds need different nutrients in order to thrive. Most fertilizers for the lawn are made up of three main components: nitrogen, phosphorus and potassium. Each component aids in the healthy germination and growth of grass seed. Nitrogen is responsible for the growth rate and bright, green color of grass. Phosphorus also promotes growth but targets the roots system of lawn, and potassium is what will give your new lawn resistance against disease and helps it survive over the winter months. Fertilizers, while generally consisting of the same three components, are distinguished from each other by the amount of each component they contain. When choosing fertilizers for grass seed, they will be labeled with three different numbers, each signifying the percentage of nitrogen, phosphorus and potassium. For example, a lawn fertilizer labeled as 12-4-8 will have 12 percent nitrogen, four percent phosphorus and eight percent potassium. 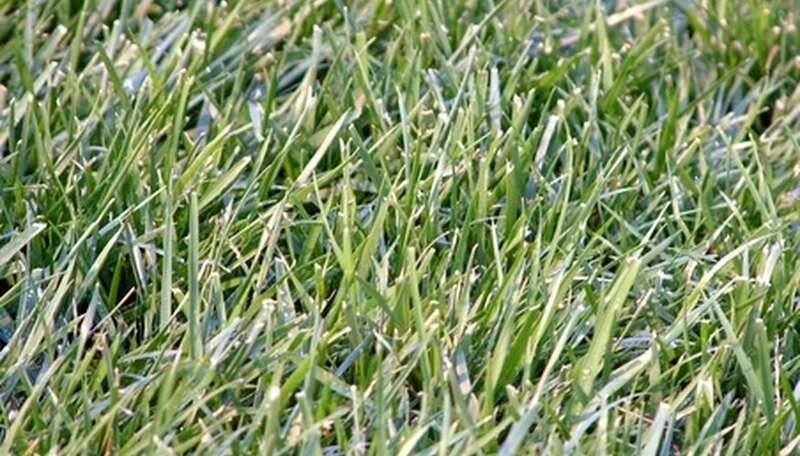 Other common fertilizers used for grass are 10-10-10, 6-6-6 and 16-4-8. In order to choose the correct fertilizer for your grass seed, you will have to take into consideration factors such as soil type, rainfall, grass seed variety and sun exposure. Some grass types require more nitrogen than others in order to thrive, and a nitrogen rich fertilizer, such as 16-4-8, may be required. Your type of soil will determine how much phosphorus and potassium your soil requires, which can be determined with a soil test kit. Grass seeds sown in shady areas will require little to no fertilizer, as they will grow at a slower rate. Lastly, rainfall also plays a part in how much nitrogen your fertilizer should contain. Proper application of fertilizer is important to the success of your new lawn. The amount of fertilizer applied to the soil is most often determined by how much nitrogen your grass will require. Typically, 2 lbs. of nitrogen for every 1,000 square feet is sufficient for a healthy lawn. To calculate how much fertilizer you'll need, divide the number representing the percentage of nitrogen in the fertilizer by 100 to find out how much nitrogen is present. With a bag of 16-4-8 fertilizer, you will divide the 16 by 100 and come up with an answer of six. Multiply this by the number of pounds of nitrogen needed (2 lbs. for every 1,000 square feet) to find the total number of pounds of fertilizer needed. It has been said that there can be too much of a good thing, and this is certainly the case with nitrogen-rich fertilizers. It is important that you accurately calculate how much fertilizer your grass seed will need, as applying too much will actually harm your new lawn. Excessive nitrogen is responsible for burning grass seed and established lawns. If you are in doubt, choose a fertilizer with a lower nitrogen percentage to avoid this issue.